Fully refurbished HP Laserjet IIP, please also check below for the accessories we offer for the model IIP. If you have any questions feel free to Email, FAX or Call us. We also offer REPAIR service on this model of printer, if you wish to have your printer Repaired please Go Here. Duty Cycle(pages per month) 6,000. Recommended for printing any text documents, small to medium spread sheets, small to medium forms, and small graphics up too 1/2 page. We do not recommend using this printer to printer any large graphics or any high resolution graphics as the max resolution is 300x300 DPI. Large spread sheets and or forms that are over 10 pages, both of these will slow print speed. 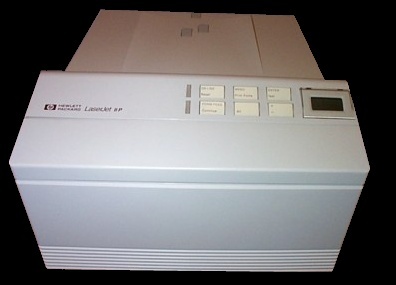 The laserjet IIP is great for the small office and home use where space saving is important. Almost half the size and wieght of it's big brother the II, the IIP is just as reliable. The reliablity of this series has keep it a popular printer even years after it has been discontinued. Do you need to add additional memory to your printer? More macros to be defined. You will need a memory upgrade if there is indication of printer buffer overflow. Memory upgrades speeds up printing only when the print format is Postscript. Otherwise, printer download and print speed are unaffected.